Lunasol released a pretty big collection for spring including new eye palettes. 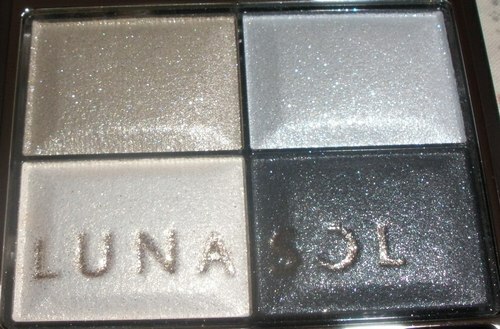 Out of the 5 colors one really appealed to me so I ordered the Ocean Scene Eyes in 04 Smoky Ocean. I also got the Cream Cheeks in EX01 Light Pink and one of the new Full Glamour Liquid Lips (in 07 Sugar Pink). 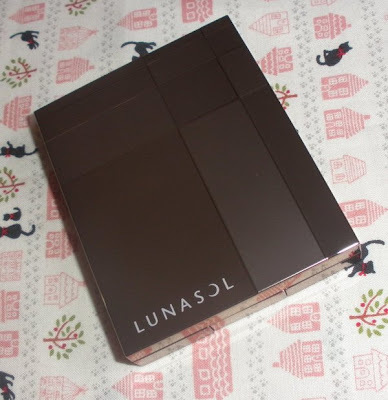 To be honest most of the Lunasol palettes I tried so far didn´t work for me. The older generation of eyeshadows didn´t have a nice texture/good pigment and were just very mediocre and in general the color combinations don´t work for me as they tend to be on the warmer/bronze/colorful side. 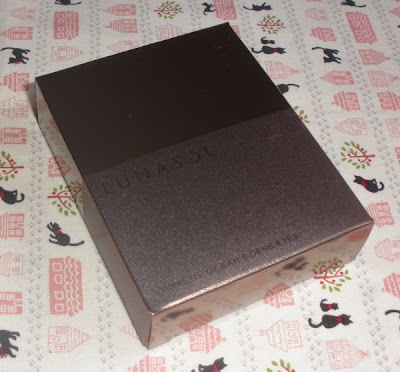 I usually have better luck with Kanebo´s cheaper brands like Lavshuca, Kate and Coffret D´or. 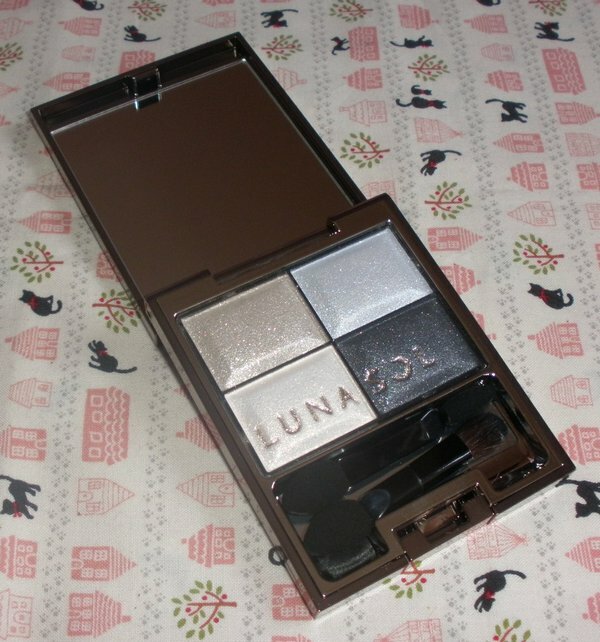 I have a few fantastic palettes though including the ones from the Xmas 2010 and 2009 coffrets! 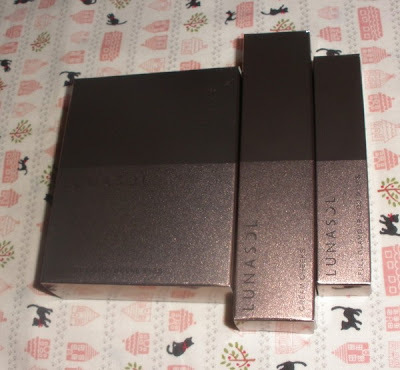 The palettes come in the usual bronzey case along with high-quality applicators. The texture of the Ocean Scene Eyes is really good as the shadows feel smooth and silky with a gorgeous glistening but not glittery finish. In fact finally this is a palette without that useless glitter shade! 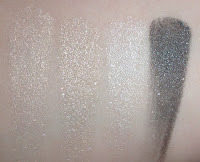 The shadows have the right level of pigment (sheerer lighter colors, very pigmented dark color) and blendable and last throught all the day for me. I have to say I am very impressed with the Ocean Scene Eyes quad! 04 Smoky Ocean is a very elegant combination, the included colors are a smoky deep bluish gray, pale powder blue, light golden beige and an off-white. While the 3 lighter colors appear all similar in the swatch there is still enough difference to them for giving an interesting look. 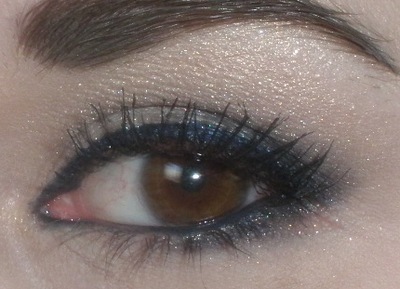 I actually really loved the EOTD I did with the palette yesterday where I paired the palette with a royal blue gel liner from Kate and the Heroine Make Long & Curl mascara from Kiss Me. 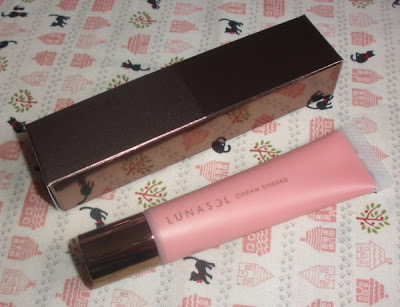 I am not a big cream-blush user but I was sure Lunasol would come up with a really nice product in sweet versatile colors. There are 3 colors, all light and natural as far as I can judge. 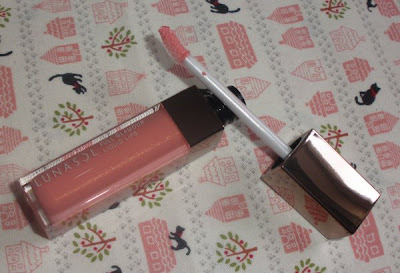 These come in squeeze-tubes with a thin nozzle so you can dispense as little or much as you want. The texture is indeed creamy and easy to spread on top of cream foundation, BB Cream etc. 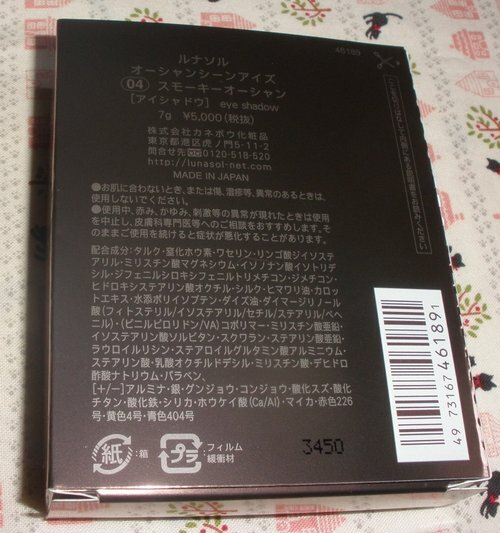 You can´t apply this on top of powder or powder foundation though as it gets really blotchy. 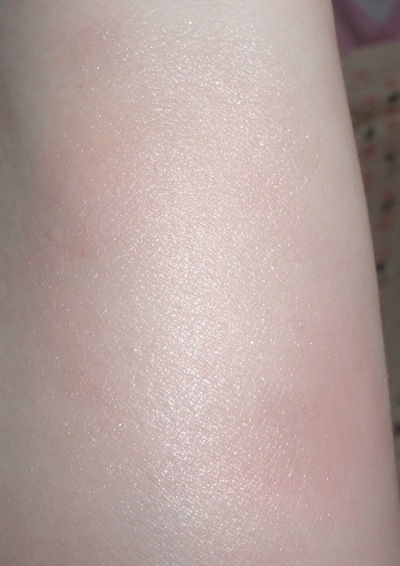 The finish is shimmery, almost dewy. 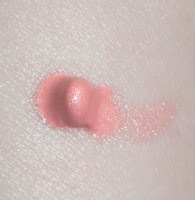 For me it´s actually a little too much so I like to tone it down with a bit of translucent powder on top. 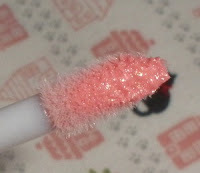 When topped with powder the staying power is really good and the color EX01 is a very pretty fresh coral pink perfectly suitable for spring. 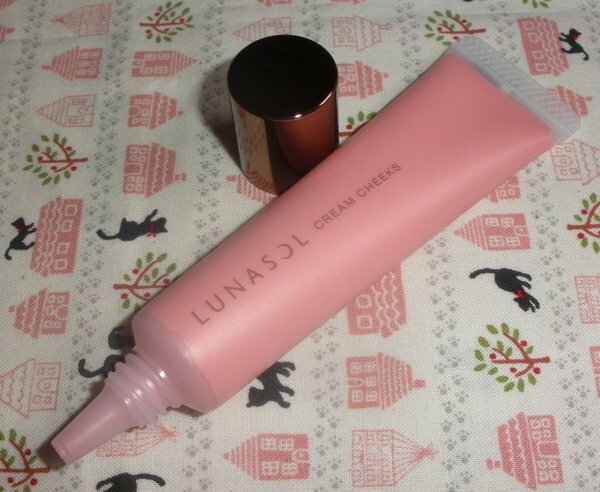 Overall a good-quality cream blush but not a must-buy for me. 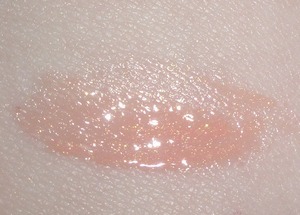 First pic shows the blush spread out a little, the 2nd how it looks like when blended in completely. 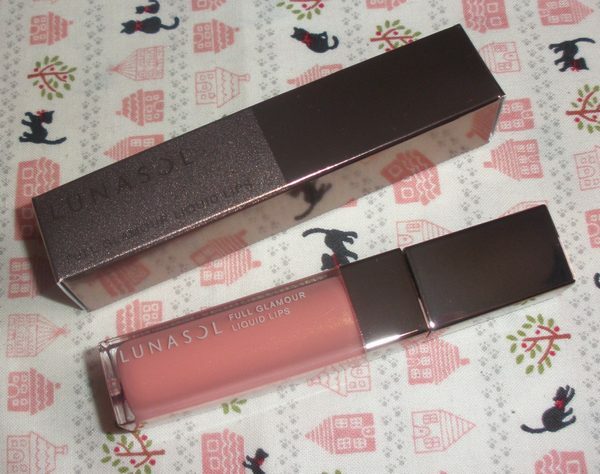 Lunasol´s lipsticks and glosses are always great, period. 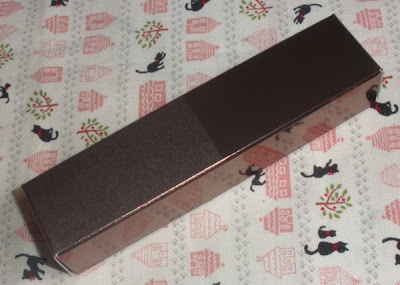 Kanebo in general is a fantastic lipstick-maker...Kate, Lavshuca, Coffret D´or - all have great lippies in their lineup. The Full Glamour Liquid Lips is a true liquid lipstick and not just a pigmented gloss. The texture is very creamy and easy to spread and the finish and feel is like a pearly lipstick....also there is no stickiness in the formula, just creamy goodness. Staying power is good, too, about 3 hours without reapplication. This product wears off without gunking up so overall it´s really a great albeit pricy lipstick. 07 Sugar Pink is a gorgeous light coral pink. All in all the whole collection is very worth checking out, all items seem perfectly suited for creating elegant and sophisticated looks. I got all products from Adambeauty. Wow they're beautiful! I want the cream blush and the liquid lipstick! So gorgeous! I agree! Kanebo is an excellent lip products maker! everything looks beautiful on you.. im particularly intrigued with the cream blush! thanks for the review ! beautiful! i love the blue liner on you and the lippie and clush is so pretty! 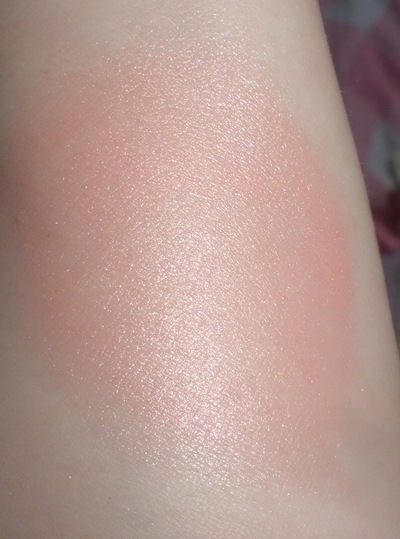 Wow, the blush went from being visible/pigmented to barely there. 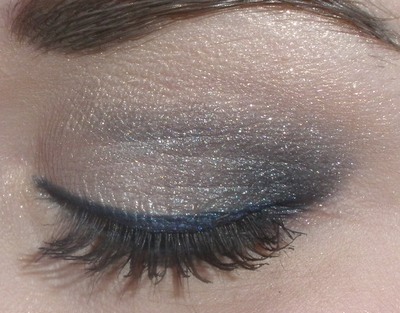 But I do like the shimmer it have. And LOVE the lipgloss. Lovely colours...I've got to get into the Lunasol bandwagon. Great soundbites in the NYT article, btw! ohhhh i love that eye make-up!!! 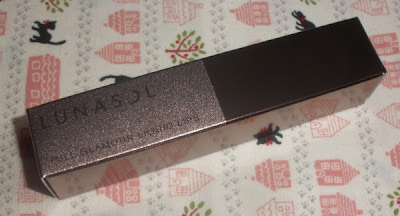 und der eyeliner passt perfekt zur lunasol palette! I'm still waiting for my Smoky Ocean to arrive, which should in the next days. 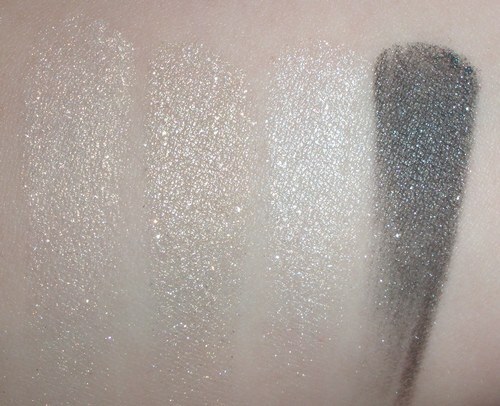 Your swatches are awesome as always, Kathi! And the greyish blue shades look so good on you! Best kathi rolls in NJ are a wonderful combination of styles, colors, preparing, nutritional balance, fragrance, taste and appearance.